(1) In a decision announced late on May 17, Colombia’s Constitutional Court appears to have dealt a severe blow to implementation of the FARC peace accord. In a 5–3 vote, the magistrates did away with key parts of “fast track,” the special legislative authority the Court approved last December to allow swift passage of laws to enact the November 2016 peace accord’s commitments. The new changes result from the Court’s consideration of a suit brought by Iván Duque, a senator from the opposition party led by former president Álvaro Uribe, the peace accord’s most vocal opponent. The Court struck down the ability to get a vote on a full bill without amendments or modifications (votar en bloque, similar to how the U.S. Congress approved free-trade agreements in the 1990s and 2000s). It also struck down a requirement that the executive branch approve of changes to implementing laws under “fast-track” (a protection against changes that might violate the accord’s commitments). The decision does not undo the few peace-implementation laws that have already passed, like the amnesty for ex-guerrillas not accused of war crimes. Without “fast track,” the danger is that Colombia’s Congress might treat what was agreed after four years of negotiations in Havana as a mere suggestion. Legislative wrangling could delay, change unrecognizably, or quietly kill some of the government’s accord commitments. We still need to see the actual text of the decision to interpret the potential damage. In the meantime, here is a sample of what analysts are saying. Juanita León and Tatiana Duque of La Silla Vacía discuss the “hard blow” that the Court’s decision represents for the peace accord’s implementation, which they say is a “triumph” for Uribe’s right-wing opposition party. On the bright side, though, León and Duque say that congressional deliberation and compromise might restore to the accord some of the credibility it lost when voters rejected it by a 50.2 to 49.8 percent margin in an October 2, 2016 plebiscite. “The legalistic complexity of the debate is such that few Colombians have managed to understand the devastating effects that this decision has on the future of peace in Colombia,” wrote Semana columnist María Jimena Duzán. Semana magazine lays out seven pessimistic effects that the decision will have on the peace process, concluding that “the ball is now in Congress’s court” at a bad time–just 10 months before the next quadrennial legislative elections. As the Trump administration prepares to issue to Congress its request for foreign assistance in 2018—which is expected today—two senators appear to be occupying the Republican legislative majority’s “turf” on Colombia policy. Sen. Marco Rubio (R-Florida) explained in a Miami Herald column that he opposes the FARC peace accord, but supports the “Peace Colombia” aid package with conditions. Sen. Roy Blunt (R-Missouri) supports a more generous approach to lock in the peace accord’s security gains. 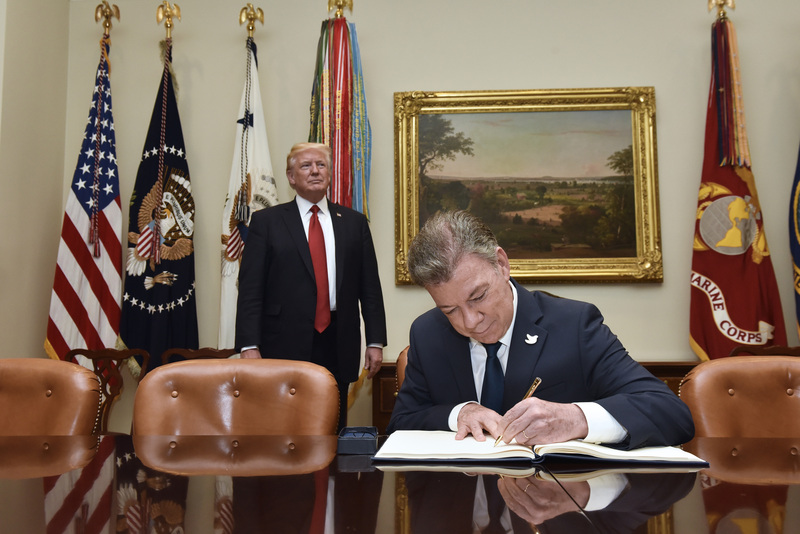 Sen. Blunt, along with Sen. Ben Cardin (D-Maryland, the ranking Democrat on the Senate Foreign Relations Committee), co-chaired an Atlantic Council task force that issued a report coinciding with Santos’s visit, which endorsed aid within the “Peace Colombia” framework. (3) The Colombian Presidency’s post-conflict advisor, Rafael Pardo, says the government will launch 12 pilot projects this year to start work on one of the most ambitious parts of the peace accord’s rural development chapter: a cadaster, or mapping of all landholdings in the country.